By Allan Fox: WBA/WBC super middleweight champion Andre Ward’s victories over Chad Dawson and Carl Froch in his last two fights may have effectively closed the door on him getting other big important fights of that kind in the future. Fighters tend to not want to take on a guy that is dominating everyone the way that Ward is right now, and I think he’s going to be sadly disappointed at what he’s going to settle for in his next fight. Let’s look at what’s out there at super middleweight. There’s Carl Froch, Thomas Oosthuizen, Adonis Stevenson, Lucian Bute, Edwin Rodriguez, Sakio Bika, Andre Dirrell, Anthony Dirrell, Don George, Kelly Pavlik, Robert Stieglitz, Arthur Abraham, Brian Magee, James DeGale, Mikkel Kessler, George Groves and Karoly Balzsay. The chances of Ward getting any of those guys for his next fight are pretty slim, and most of them aren’t big names anyway. Even if Ward can get someone like George, Rodriguez, Stieglitz, Balzsay or Magee, would anyone care to see those fights? None of those are big names and it would be dull to watch Ward beat up on them. I think it’s safe to say that Ward isn’t going to get Kessler, Froch, Pavlik, Bute, Groves or DeGale in the ring. I see those fighters as moving past Ward as if he doesn’t exist to focus on trying to take the WBO strap off the weak link among the super middleweight champions Arthur Abraham. Ward may have to settle for simply defending his titles against the mandatory challengers or the fringe contenders that his promoter can try and get to take the fight for a payday. I think Ward is going to be ignored by guys that are risk aversive with their careers and don’t want to risk taking a one-sided loss. If Ward wants to get big fights he’s going to have to be more like Gennady Golovkin by being willing to move up or down in weight to try and get the best fights possible. That means that Ward is going to have to be flexible about fighting in other weight classes or at catchweights. 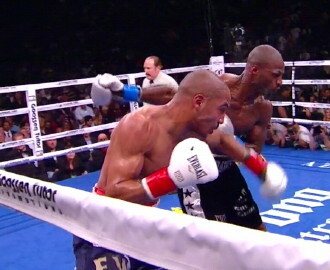 He didn’t seem to want to fight Chad Dawson at a catchweight last Saturday night. But he may have to if he wants to keep from being limited to just the 168 pound fighters, many of which probably won’t him now. What we could see is Ward spending more and more time waiting for big named fighters to agree to face him. I just hope Ward doesn’t miss more than 8 to 12 months at a time waiting for a big fight to open up, because I don’t think they will.